BabyNaturopathics.com - Selecta Marello Bath Toy Wooden Sailing Boat - Baby Naturopathics Inc.
You can earn 32 bnReward Points on this product! Marello has a wooden hull and a�plastic sail. The mast is�composed of wooden beads threaded on a sturdy elastic cord. The flexible mast�is a safety feature. 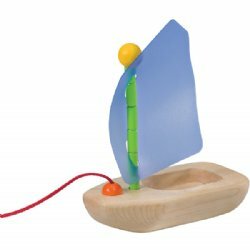 A pull cord allows your child to steer this little sailing boat.�Marello can be also be used on land for imaginative play. When�using Marello as a tub toy,�dry the boat off after play. To prolong the life of the toy, rub�the wood with�oil (e.g. vegetable oil). Selecta Marello is crafted in Germany.